Jakarta, Indonesia — To mark the beginning of 16 Days of Activism UN Women, Institut Français d'Indonésie (IFI) and the Embassy of France held a film screening of "Des Femmes et Des Hommes"/ "Women and Men" and an ensuing discussion about ending violence against women as well as challenges to achieving gender equality. Held at IFI Jakarta, the event brought together more than 100 participants from representative of EU Member States Embassies, civil society organization, media and public. It was opened by the performance of Sisters in Danger, winner of Most Popular Award 2017 UNiTE song contest. The film made by Frédérique Bedos showcase the result of a year-long investigation in the field. She captured the situation of women in Europe, the Middle East, China, India, Asia and Africa. The film brings together a collection of key testimonies, including interview with UN Women's Executive Director, Phumzile Mlambo-Ngcuka. The film underscores this year's 16 Days of Activism campaign theme, the importance of tacking challenges to equality for all, in order to leave no one behind. "Only 143 countries out of 195 guarantee equality between women and men in their Constitutions; this is in and of itself a disturbing and insufficient number. But we all know that even within those countries where equality is the rule, in practice discrimination persists in many areas," said His Excellency Jean-Charles Berthonnet, Ambassador of France to Indonesia. "The empowerment of women and girls must start with the guarantees that all societies should give them for their physical integrity from the moment of their births; for their reproductive rights; for their safety in public and private spaces; for their access to education and all the professions," added H.E. Jean-Charles Berthonnet. Sabine Machl, UN Women Representative in Indonesia added "Despite growing efforts to prevent and eliminate all forms of violence against women and girls, challenges remain. In Indonesia as well as globally, one out of three women still experiences violence during her life time. Our UN campaign emphasizes the urgency for a robust action to ensure that women and girls, including the most marginalized live lives free from violence. Everyone has a role to play: speak up and act to stop the cycle of violence." The film screening was followed by a moderated discussion with Azriana, Head of Indonesia's National Commission on Violence against Women (Komnas Perempuan); Kartika Jahja, Singer/ Activist; Sarah Spronk, Education Advisor of The Embassy of the Kingdom of the Netherlands; Emilienne Baneth-Nouailhetas, Educational Cooperation Attaché Embassy of France to Indonesia and Timor Leste; and Henry Manampiring, Author of Alpha Girl's Guide who shared their perspective on gender equality and ending violence against women, personal stories of addressing today's challenges and possible actions. In conjunction with the beginning of 16 Days of Activism and to encourage action to stop violence against women, the Embassy of France was lit up in orange from 25 November to 10 December 2017. In addition, banners and wall of commitment were showcased in front of IFI for everyone to drop their messages of hope for the future of women and girls. 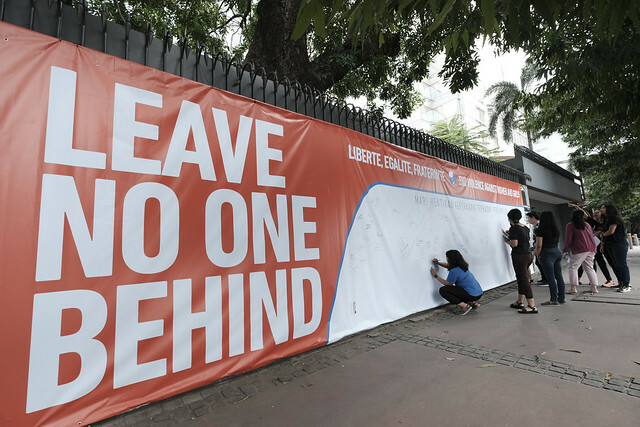 "It is with great determination for change that the Embassy of France is engaging in the "Orange the World" campaign initiated by the United Nations to raise awareness around this crucial cause," said Ambassador Berthonnet. "The elimination of all forms of discrimination is at heart of the French values, Liberté, Égalité, Fraternité. We are very happy to have this opportunity, alongside UN Women, to demonstrate our commitment here in Jakarta," he added.